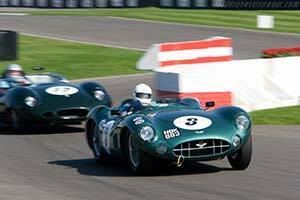 Originally built as a DBR3 in 1958, this chassis was converted to DBR1 specification for the 1959 season. In this guise it was only raced at Le Mans and Goodwood where it finished 2nd and 4th respectively. After Aston Martin's retirement of racing, it was used for a motion picture. For the 1962 Le Mans, it was loaned to the Essex Racing Stable, who entered it for 1959 winner Roy Salvadori and Tony Maggs. They retired from the race. In the following years, it was shown in the Beaulieu museum. Today it is owned by a British Aston Martin collector, who regularly races his car.